Chutneys are extremely versatile. They can bring grilled meats to a whole new level or add an interesting touch to a meat and cheese tray appetizer. While store-bought chutneys can be “ok,” a homemade and canned version is extra delicious and can be used as the perfect gift for friends! 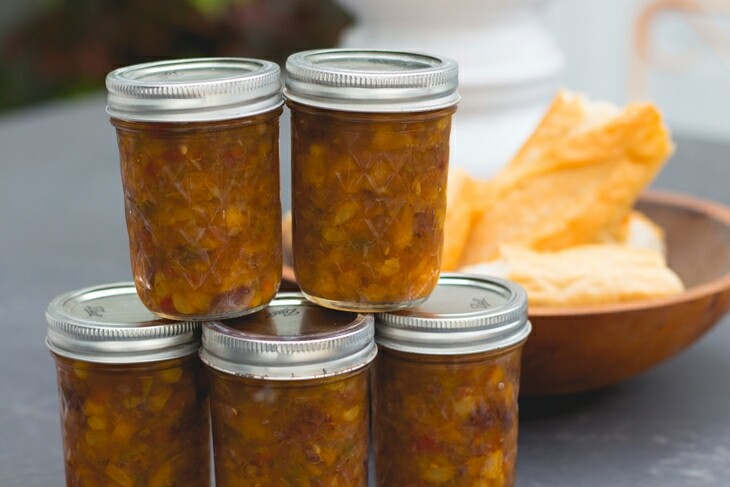 This chutney uses one of the season’s most sumptuous fruit and pairs it with a delicious blend of Caribbean inspired spices to give an out of this world flavor that you will want time and again! Roughly chop peeled ginger and tie in cheesecloth squares, creating a bag. Set aside. In a heavy bottomed saucepan, mix together vinegar and peaches and stir over medium-high heat. Bring to a boil and cook until peaches begin to become tender, about 15-20 minutes. Add sugar, onions, peppers, raisins and salt. Reduce heat to boil gently. Continue cooking to thicken and reduce chutney. This process can take anywhere from 30-45 minutes depending on how hard you cook the mixture. After approximately 15 minutes, add the bag of ginger into the chutney. After 30 minutes, add the cinnamon, nutmeg and cloves. If you don’t want the unique flavors from the spices, you can leave them out, but they do add a lot of interesting depth. The chutney can be cooked to your desired thickness. I like mine to mound thickly on a spoon. To help thicken and break down the peaches, use a potato masher throughout the cooking process to mash the peaches. Once ready, remove the bag of ginger and discard. As the chutney is becoming thickened, prepare your jars, water bath and lids. I like to put mine in half pint jars as I use it in small amounts for entertaining (and to enjoy for myself!). But any size jar is fine. Pour hot chutney into prepared jars, leaving 1/2 inch of headspace. Place on prepared lids and rings and process in a boiling water bath for 15 minutes. Remove and let set for 24 hours before removing rings or storing. Whether chutneys are new to you or are already on your go-to list, this is a must try!